A new post on the Greek Apple leaks site iPhoneHellas alleges that the second-generation AirPods will launch in March. However, a second tipster, OnLeaks, has also asserted that his sources say they will be released 'in the fall'. Both reports contain different details on what their maker may release alongside or in conjunction with these wireless earbuds. Apple has not updated its inaugural foray into the wireless headset market since 2016. Nevertheless, many fans of both iPhones and audio may like to see a second generation of the original toothbrush head-shaped earbuds. 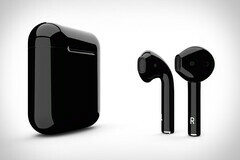 New rumors posted today (February 12, 2019) have given conflicting indications as to when the putative AirPods 2 may be released. The Greek fan-site iPhoneHellas claims that its sources in the Chinese manufacturing industry has let it known that this product will be released on March 29, 2019. Apple will also apparently unveil a 2019 iPad at the same time, as well as the long-awaited AirPower charging mat. Prior to this launch, however, the next-gen AirPods will be available via pre-orders, which will begin on March 22. OnLeaks, on the other hand, has written a Tweet stating that his sources has told him that the new AirPods will not be released until "the fall". At this point, Apple will release them in not one but a number of colors. This may be particularly exciting, as a considerable business around skinning and painting AirPods for alternatives to the single white SKU has been built up over the last 2 years. Both OnLeaks and iPhoneHellas have also picked up more novel rumors through their sources. The former also now claims that Apple will release their original earbuds in a new charging case, prior to making the AirPods 2 available. iPhoneHellas asserts that the new earbuds will allow hands-free Siri activation. They may also be powered by a fresh new version of the W-series processor, a successor to that found in the Apple Watch 3.
s that Apple will release their original earbuds in a new charging case, prior to making the AirPods 2 available. iPhoneHellas asserts that the new earbuds will allow hands-free Siri activation. They may also be powered by a fresh new version of the W-series chip, a successor to that found in the Apple Watch 3. On the other hand, OnLeaks has also noted that he cannot completely vouch for his sources quite yet, and iPhoneHellas' rumors do not deviate strongly from prior rumors about the next Apple earbuds to come.